One small step for older people with frailty, one giant leap for frailty care? report is an analysis of NHS Digital GP contract data for 2017-18. 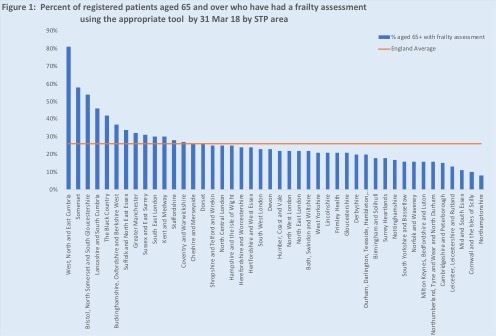 It highlights the progress that has been made, but also the wide variation across different GP practices, which suggests that many practice staff lack sufficient awareness and understanding of frailty to identify all but the most severe levels. Frailty is a recognised long-term condition which mainly affects older people and makes them less able to recover from difficulties they experience during everyday life. Their increased vulnerability means that even little upsets which may seem quite trivial to someone who does not have frailty, can have a more profound impact on people living with the condition. 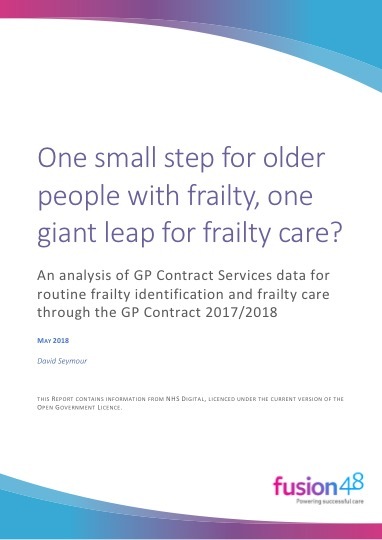 Prior to the requirements of the GP contract, most people have had their frailty identified late - usually in an Accident & Emergency Department - frequently having presented with an injury from a fall, acute confusion or another frailty syndrome. Whilst improved recognition of frailty in hospitals can lead to patients receiving the gold standard comprehensive geriatric assessment (CGA), too often these individuals endure extended stays in hospital that worsen their frailty and accelerate their dependency. They are also the patients most likely to have delayed transfers of care or worse still spend their last days on a hospital ward. The full report can be accessed online here or by clicking on the image to access a pdf version. 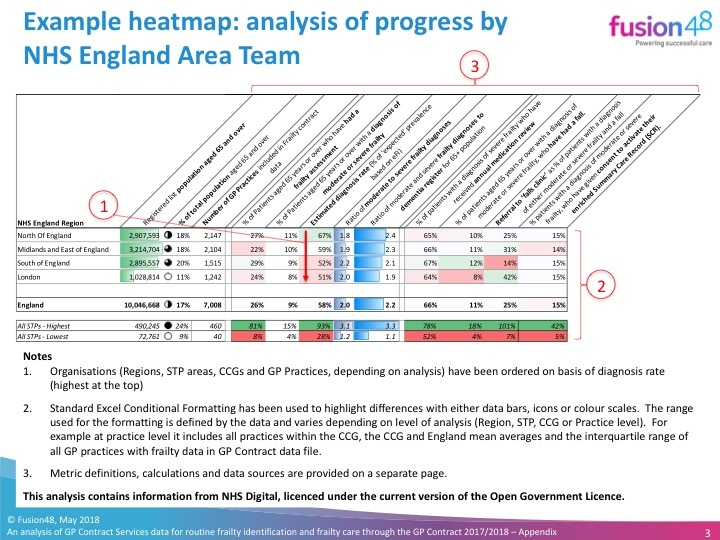 and further information and analysis, including heatmaps at NHS Region and STP level is included in the appendix.